Dengeki Playstation sat the with Kingdom Hearts series director, Tetsuya Nomura to talk about the recently announced Kingdom Hearts HD 2.8 Final Chapter Prologue, which included Kingdom Hearts Dream Drop Distance, and Kingdom Hearts 0.2 Birth By Sleep -A Fragmentary Passage. The scans can be seen here alongside some of Square Enix’s other titles. Thanks to KH13 and Kayla Copeland for providing the translation of both the interview and timeline. 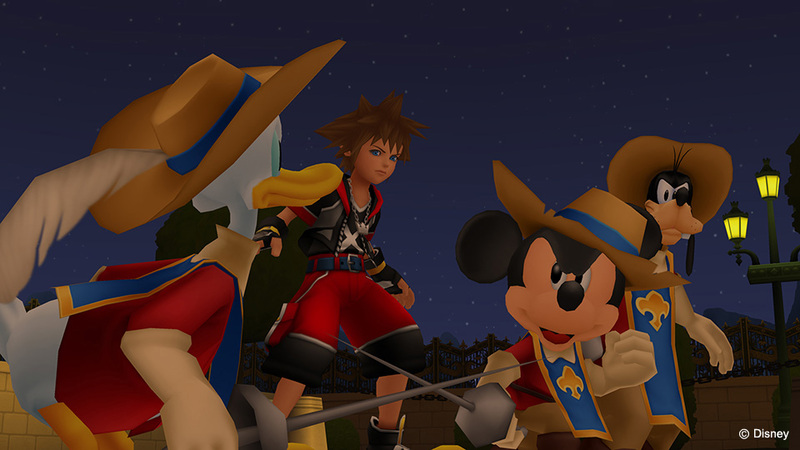 Dengeki: When were the plans for [KH2.8] set into motion? Could you tell us the aim of exclusively using the PS4 console again? Nomura: We started thinking about it after completing [KH2.5]. It was about the time that we had finished deciding on the packaging, when we thought “What about a HD version of [KH3D]?” We had been talking about [KHIII], but since [KH3D] is such an essential preface to the story, I thought that, no matter what, I wanted to make an HD version of [KH3D] before [KHIII] was sold. When I was thinking about whether or not to release [KH3D] HD on its own, the time until we could play [KHIII] became shorter–rather than being affected by a change to the [KHIII] engine’s initial plans. I knew I wanted everyone to get a taste of the world of [KHIII] as quickly as possible, no matter what. That being said, just like with [KH1.5] and [KH2.5], I thought about how I wanted to package [KH3D]’s essential story with a product that was a part of [KHIII] and its technology. In result, it was inevitable that the console would be the PS4. Dengeki: I’m really excited to play [KH3D] on a non-portable console, but in regards to [KHx], why did you decide to make the story into a theatrical production? Nomura: [KHx] and [KHUx] are both still running games, and they’ve still got a lot left to cover. For that reason, our intention is actually not to show the story as it is right now. In [KHx] and [KHUx], from the players’ perspective, the story is continuing onward, but in [KhxBC], the story is told from the character of the players’ affiliated unions, the Foretellers. Since [KHx] and [KHUx] are online games, there are probably fans that think the hurdles to jump are too high. However, in order to tell the full story of [KH], the Foretellers are very important characters, so I wanted to make sure players encountered the world of [KHx] and [KHUx] some way or another. The Foretellers aren’t really characters that can be fit into the timeline somewhere, so we are dedicating their story to a theatrical production. Dengeki: Please tell us more about the details and aim of the brand-new supplement based on [BbS], which is different than any of the HD remasters so far. Nomura: Actually, this was what I worried about the most. We showed this for a bit in the secret episode of [KHBbS FM], but the concept for two chapters of [BbS] is something we’ve had for a while, and because of problems with time, it’s become just a morceau. That concept itself is living on as a setup, so it was our plan to show it at the beginning of [KHIII], but since the volume of material in [KHIII] has increased, I was thinking it was something we just touched on a little. Just as I explained in your previous question, we won’t show the whole thing of the initial concept, but we decided to show it ahead of [KHIII] as a short episode. Dengeki: Could you please tell us precise release dates, as well as the progress in development at this time? Nomura: It’s not quite time for us to give an exact release date, but we’re planning on a release in 2016. As far as production goes, since we’re working on it alongside [KHIII], we’re using the same technology in some parts, and I can’t talk about what current phase we’re on. Dengeki: Can you tell us more about what you’ve had to change for [KH3D], such as going from two screens on the handheld to one on the console, etc.? Nomura: Since everything in the original was developed with the idea of having two screens, we’re having to reproduce everything so that it fits one screen, so it’s much different than the other HD releases, as it is more of a “remake.” Since the original design for the 3DS was a lot of fun to play with, in order to keep that same fun while remaking it for the PS4, we’re having to cover a lot of ground and make lots of changes. I will have more details in the next interview, so please wait until then. Dengeki: Do you have any kind of added elements decided? Nomura: Unlike [KH1.5] and [KH2.5], we’re working with three productions that are not simply a change to HD. As I said before, we’re combining [KH3D] into one screen so it’s basically a remake, and the other two productions are completely new and both utilize [KHIII] technology–since the density of the original products are so great, we don’t really have any big added elements. There will be items to collect that are newly added, like what you saw in [KH1.5] and [KH2.5]. Dengeki: Will the movie for [KHx BC] be a completely new product? Nomura: Yes, it’s completely new. We’re making it with the same technology used in [KHIII], and the characters that appear are all new characters, so the Foretellers and Chirithy will need voices, so we have to work on casting as well as making their models, the scenes…everything will be made from scratch. However, while deciding the scenes, we were writing scenes for the base game [KHx] at the same time, so we inserted some of those scenes into [KHx]. So, the story will be one that players of [KHx] will more easily understand in the timeline. Dengeki: Can you tell us what you mean by the title “Back Cover”? Dengeki: Could you tell us more about the movie’s details and highlights, as well as the amount of content? Nomura: People currently playing [KHx] and [KHUx] already know this, but we have not really seen much of the Foretellers as individuals outside of each of their organizations. In this production, we hope to make clear the thoughts of each Foretellers, as well as why they formed their unions, and I think what they’ll have to say will be very interesting. As far as the content volume goes, since this won’t be the length of a full game, I can only tell you that it will be in the format of a short story. Nomura: That’s right. Aqua is the main character, so the story will follow Aqua through the realm of darkness. However, the flow of time in the realm of darkness is different, so it’s not simply ten years that have passed. The beginning of the story is after the secret episode in [KHBbS FM], but the story’s ending is the finale, so I can’t talk about it. Actually, we prefaced to it in the secret episode, but in the opening, just before the new journey in [KHIII], we’ll tell you about King Mickey meeting Aqua again, who has been hidden away all this time…it will be that kind of introduction. Dengeki: As far as gameplay goes, how has the system and action changed? Please tell us about this along with the content volume. Nomura: It is similar to the flow of [KHBbS], but we plan to include a portion that resembles [KHIII]. For details, please wait until the next information release. As far as volume content goes, this short story will be about the length of one world in the usual KH series. We want to give the players something they’ll be satisfied with by letting them experience [KHIII] gameplay in a sample size. Dengeki: Can you tell us about the meaning of [0.2]’s title, “Fragmentary Passage? Nomura: As far as content goes, we can’t include a full volume of content to play with like the second chapter of [KHBbS], so it’s just a “fragment,” and we left that part of the subtitle. [0.5] is one of the letters and numbers that appeared in the secret episode of [KHBbS FM], and that meant full volume, so we decided on [0.2] this time, to indicate that there will be more content to come. However, the remaining passage will be told in [KHIII], so we wanted to show that this production is closely related to [KHIII]. Dengeki: Finally, [KH2.8] will be an extremely important bridge title to [KHIII], won’t it? Can you tell us about any noteworthy points in that connection? Nomura: For [KH1.5] and [KH2.5], we added the word [ReMIX] to the title, but for [KH2.8] we’re adding [Final Chapter Prologue]. This is not to say that this is the final chapter in the KH series, but it does mean that [KH2.8] will continue to pull the curtain closed on the story of the Dark Seeker. As I stated earlier, the content serves as a preface to [KHIII], starting with the HD [KH3D], and [KHUxBC] will also be very important to the KH series. I mentioned this in a previous answer, but [KH0.2BbS] is closely related to [KHIII]. It’s definitely no mistake to say that the three productions packaged in [KH2.8] are all in preparation for [KHIII]. The oldest tale in the series. Explains the happenings of the world 100 years before Sora received his keyblade. I’m okay with that. We will have time to play KH 2.8 and FFXV next year. Square would not be smart releasing two great AAA titles in the same year. Square Enix milked this series too much it’s so sad. All of these backstory stuff could be added in KH in forum of documents we can collect int he game. And making so many games in different consoles is going to isolate many players from piecing together the looooooooooong winded story. Too long, too many years. They know better, but they know money first. Come on Jesus, change history with your godly powers and fix this! Nomura: FFXV released date finalized for 2026. Well, I kinda feel that FFXV will be delayed too. It’s a problem in general with Squeenix. Too many platforms for their games, it’s ridiculous. Noone should be expected to purchase all of these platforms just to play their favourite series. If this is implying that COM and 358/2 days occured at the same time (and by the direction of those arrows I’m guessing that it does), then it’s wrong. 358/2 days happened AFTER Sora was put to sleep by Namine and thus allowing his Nobodies, Roxas and Xion to take form. During COM, Sora was wide awake. Get your facts straight! Roxas was actually born when Sora unlocked his heart to free Kairi’s towards the end of the original Kingdom Hearts. The organization members aren’t sent on the mission to Castle Oblivion till a bit after the start of 358/2 days. They know darn well most handheld browser KH games can be explained in forms of cut scenes and documents in flagship KH games. Take Coded for example, this is milking the franchise at it’s best. Pulling convient plot out of his behind (Nomura) to make a game that doesn’t have to exist. And now that exist, you ahve blind fans defending it’s existence for the sake of the series. And don’t get me started with other issues with this series, and I love the series, somebody need to put Nomura in check.